For longer-term investment (more than 3 years), fundamental analysis is preferred over technical analysis but technical analysis can also be used for longer-term investments. Let me try to explain how I use technical analysis for longer-term investments to find the right time to invest in the right stock and at the right price. 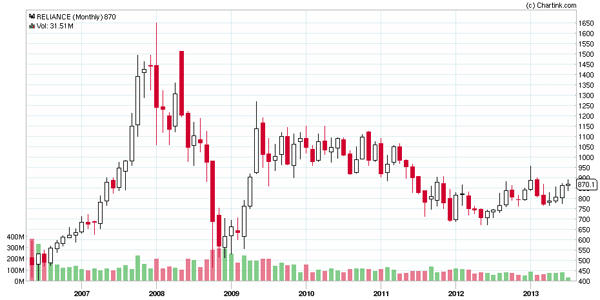 Let us begin with looking at 1-year daily chart of Nifty. 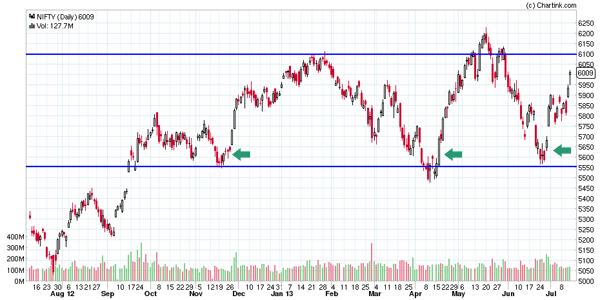 In the above picture, I have drawn 2 horizontal blue lines around 6100 and 5550 levels. The importance of each of those levels is significantly high and this can help us to find the right stock to investing and at the right time and at the right price. 6100 Nifty Level is very important for Indian market. In December 2007 January 2008 time, Nifty touched 6100 and everything with respect to Indian Equity market and India as a whole was looking awesome. Investors never could have made a wild guess of a crash in Indian market but then the crash came in and Nifty touched almost 3000ish levels. 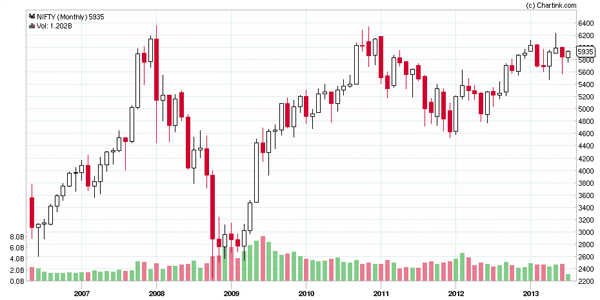 In November 2010 almost after 3 years Nifty again tested 6100 and then Nifty yet again reversed to 4500ish levels in next 12 months. After touching 4500 Nifty took 1.5 years to reach 6100 yet again and as expected 6100 again proved to be vital resistance point that Nifty could not cross. So the significance of 6100 is quite a big even when investing in the market because market and especially Nifty looses all its steam around 6100 and has reversed significantly from that level multiple times. Now we know 6100 is when Nifty has shown signs of weakness. So now we know for sure when it may not be right time to be investing in the market even for a longer term around those levels. I get so many emails and phone calls where people say they are long term investor and have remained invested in many stocks for almost 5 years+ and still the valuation is almost half of what they have invested. Forget about the profit. They want me to suggest how they can just recover the money they invested. 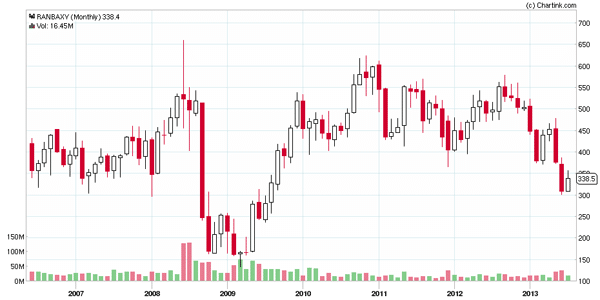 Reliance Industry or Ranbaxy are few such stock examples that I get from user emails and so let us see charts of both of them for last 8 years. You can clearly see in the above stocks, the return on investment from 2007, 2008ish time till date is almost nothing and such stocks are endless. So even if someone remain invested in market for 5 years, still may be struggling to recover invested amount where as in other non-risky investments, you amount could have easily doubled your investments. So you have to be choosing the right stock and investing at the right time and so let me help you do exactly that. Now we know for sure the not so right time to be investing in market i.e. Nifty around 6100 and so now we have to be finding the right time to be investing and this can be done if we re-analyze the first chart of Nifty. In the last year or so we find that Nifty bounced back almost 4 times from levels of 5500 clearly indicating good support zone for Nifty. 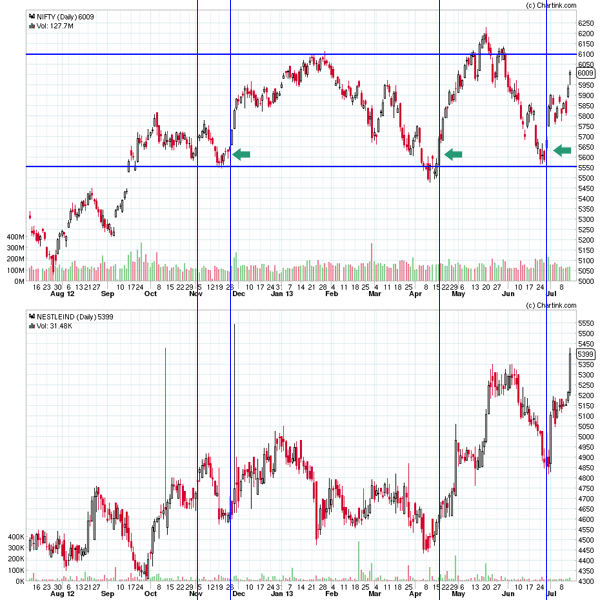 So invest in stocks in the leg up after the support is tested and not broken by Indices. Investors do not have the time to track daily movement of Nifty. So we have to have support levels for Nifty that we keep a watch on and in our case it is 5550. Once Nifty starts falling and there is buzz in the market about what would be the next support, this is when investors become active and watch out for the support level. Once Nifty hits that magical level we can keep close look on how it performs. Once we see that Nifty has not broken the support significantly for a week or two, we can think about investing in the stocks of our choice. So now we know the right time for market for our longer-term investments so now let us find the right stock as well. We know it is the right time to be investing in the market but then we have to find the right stock as well. So here is what I follow when it comes to finding the right stock to invest. I prefer investing in stocks that are close to 52 weeks high (opposite to those who prefer buying stocks that are close to 52 week low). These stock may give break out very soon because Nifty and other indices had lot of correction but these stocks were least effected by the downward movement of indices and Nifty and are trading very close to their 52 week high. We know this is right time to invest and we have lists of stocks that are our potentially right stocks and so what next? Let me explain this with an example of Nestle India which was hitting 52 week high in that time frame (and I have made quite a few investment into it) as well when Nifty was in correction mode. Clearly the vertical blue lines tells that stock has been doing significantly well with respect to Nifty and so it could be that once Nifty starts performing, this stock may do wonders and we see same thing happening. A point to note here is that we know the right time for the market and the index but this may not be the right time for all the stocks we may have from our list. It means you may need to wait for few days to see if the stock’s correction mode is over and if it has started moving into the leg up maintaining the support level. This has dual advantage to re-verify if the leg up in the market is intact or it was just a blip that you misread. Are you still investing because someone else has invested? Its time to educate yourself and I have explained the entire process I follow for investments and it has worked for me really really well and I hope this helps long term investor invest with confidence in market. If you have any questions please speak your mind out in comments below and I will be more than happy to answer them. If you want to be sharing your feedback, you can do the same in comments and I will love to read them as well as apply them to make this blog better.